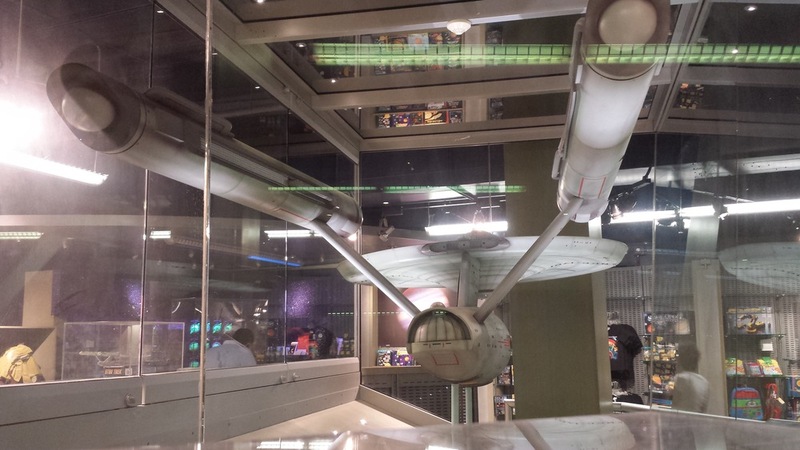 The Enterprise is surrounded by Star Trek merch. The un-detailed port side. NASM covered up openings in the model used to run wires to power its motorized interior lights. I hate to see her go but I love to watch her fly away. My first radio story will be broadcast today. You can listen to it here right now. The process of assembling and editing it was not all that much different from making these. Although in this case I had expert help -- WAMU managing producer Tara Boyle -- to make the piece sound better. The story is about the starship Enterprise. That is, the impressively large, now-49-year-old model that appeared in every episode of Star Trek, 30 years before computer graphics became Hollywood's defacto visual effects methodology. I haven't spent enough time with the various spinoff series to get much of a read on them, but original-flavor Kirk-Spock-McCoyStar Trek is a thing I love. I initially imagined this segment as a Daily Show-style news package wherein I would feign indignation that an artifact as significant as the civilization-seeking, boldly-going Enterprise rates a spot only in the basement of the National Air & Space Museum. (Apparently they also have some spacecraft there that have actually flown in space.) That approach proved to a be little ambitious for my first time out of the gate. There were a couple of jokes and a couple of clips it pained me to lose, but I'm happy with how it turned out. My favorite formal thing about the story is that I managed to use, chronologically, music from three eras of Trek: Alexander Courage's 1966 theme for TV series, two snippets of James Horner's score for The Wrath of Khan from 1982, and finally, Michael Giacchino's theme from the 2009 Trek reboot directed by J.J. Abrams. It didn't occur to me until very late in the editing to use Horner's cue "Spock Dies" underneath the part of the story where NASM curator Margaret Weitekamp discusses how Paramount Pictures didn't believe Star Trek would be heard from again after the show was cancelled. As with the unsinkable Mr. Spock, death proved to be merely a temporary condition for the Trek franchise. Horner's music is so full of wonder and possibility that I almost can't believe bringing Spock back wasn't part of the plan all along, even though I know for a fact that it was not. Anyway, that cue turned out to work perfectly for that part of the piece. My thanks both to Dr. Weitekamp and to Jim Garvin of NASA. Both were generous with their time and insight, and I wish we could've heard more of their voices in the story. There's only so much you can cram into seven minutes of radio. It was pure coincidence that I happened to visit Goddard Space Flight Center to interview Dr. Garvin on Sept. 12 -- the same day NASA announced that Voyager I, the unmanned probe launched in 1977, had become the first man-made object ever to travel beyond our solar system into interstellar space. A milestone in human history, and here I was, showing up to talk to him about Star Trek. If he thought that was silly, he didn't let on. But I don't think he found the topic silly. 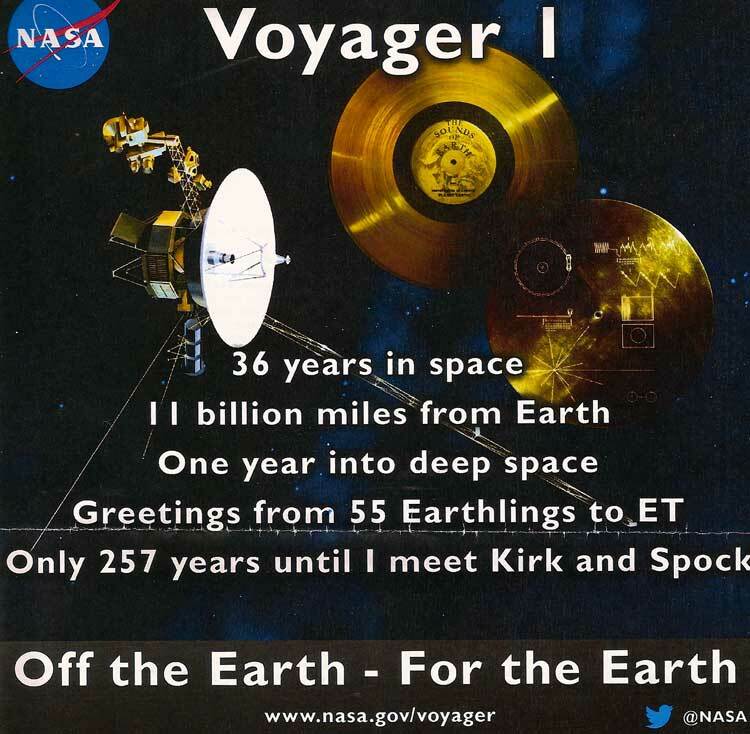 He actually gave me a flyer they'd printed up with Voyager I's stats. Only 257 years until I meet Kirk and Spock, it concludes. I visited Goddard just hours after NASA's historic announcement about Voyager I.
Dr. Garvin has a reproduction of Georgia O'Keefe's Ladder to the Moon in his office. He pointed out to me that O'Keefe painted it in 1958, the year NASA was founded. 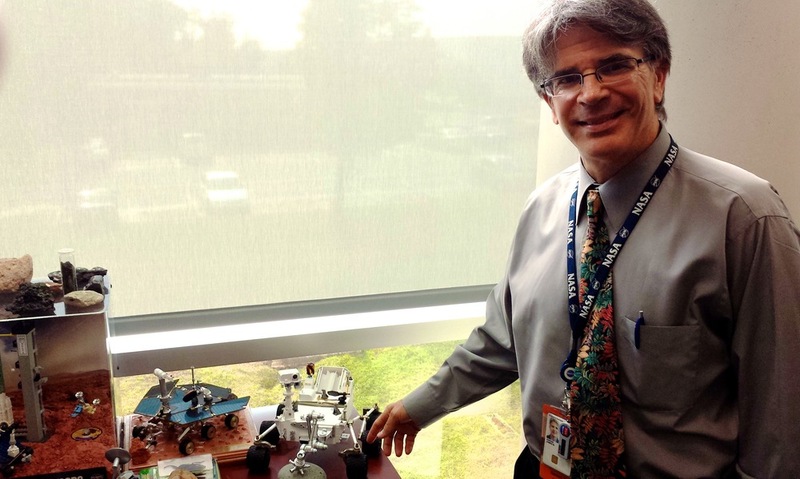 He's also got a model of the Mars rover that used to sit on President George W. Bush's desk. Bush broke his old model, so Garvin gave the President his and took the one the then-Commander-in-Chief busted. I have never met anyone who has more enthusiasm for his work than he does. Here, watch his TED Talk. Jim Gavin, Chief Scientist, in his office at Goddard Space Flight Center. This feels silly, but I have some other yous to thank: Thanks to my friend, Metro Connection host Rebecca Sheir, for giving me the final push to try a radio piece, something I've been wanting to do for years, and to the aforementioned Ms. Boyle for producing it. Thanks to my space-geek pal Heather Goss for guidance and introductions. It was my I'd-take-a-bullet-for-her-without-hesitation pal Rachel Manteuffel who suggested the story to me in the first place, so thank you, Rachel. 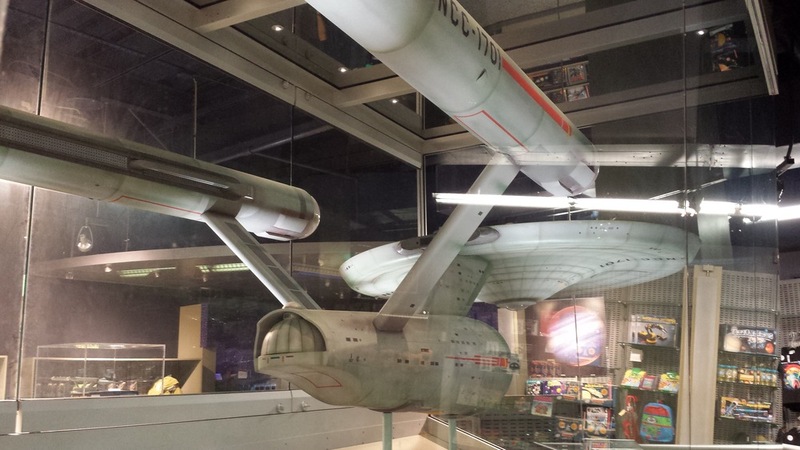 Actually, Rachel was the person who told me the Enterprise is at the Air & Space Museum, a fact that eluded my awareness, somehow, up until she mentioned it. Even though I visited the museum as a kid and have lived here in DC for eight years. I'm not embarrassed to be a geek; I'm embarrassed to be a lousy geek. Anyway, I hope you dig the story. Mentor of Attention: The Night Watcher, reviewed.